Yes, the pretty blossoms decorating these cupcakes add to their appeal, but their tender, moist texture and sweet lemon taste define their real bloom. Think Mother’s Day, bridal showers, or any event at which you want to serve a pleasing, eye-catching dessert and you’ll know when to turn to this recipe. The cupcake batter comes together quickly and easily without the need to cream the butter and sugar. Just be sure to follow the times specified for mixing and beating the ingredients; less or more time than the recipe states will alter the texture and structure of the cakes. Brushing the cooled cakes with a vanilla-flavored sugar syrup is an optional step but one that assures a rich taste and moist texture that is often missing in cupcakes baked in our high, dry climate. The decorative blossoms and leaves that top the cupcakes are commercially made by Wilton and available on their website. 01 Preheat the oven to 350 degrees, with a rack in the middle position. Line the cupcake pan with paper liners; lightly grease the liners. Gently whisk the eggs, milk and vanilla in a small bowl until combined. 02 Place the flour, sugar, baking powder, and salt in a large bowl and, using an electric mixer on low speed, blend them for about a minute until combined. Add the cut-up, room-temperature butter and half of the egg mixture and mix on low speed until the dry ingredients are moistened. Then, turn the mixer to medium-high (medium if using a standing mixer), and beat for about one and a half minutes. Scrape down the bowl. In three additions, add the rest of the egg mixture. Beat for 30 to 40 seconds after each addition and scrape down the sides of the bowl. 03 Spoon the batter into the prepared pan, filling the paper liners three-fourths of the way to the top. Place the pan in the oven and reduce the temperature to 325 degrees. Bake until a wooden toothpick inserted in the center comes out clean. Start checking at about 29 minutes for standard cupcakes, 23 minutes for 2-inch ones. Remove the pan from the oven when done and place it on a rack. Let it rest for about 10 minutes, then remove cupcakes and cool them completely on the rack. Once cooled, the cakes can be frozen for month. Thaw before proceeding to the next steps in the recipe. 04 Make the sugar syrup by combining the sugar and water in a small saucepan, bringing it to a boil while stirring constantly, and simmering it until it thickens (this takes about 4-8 minutes on my stovetop). Remove the pan from the heat, cool until the syrup is lukewarm, and stir in the vanilla. Taste and add more, if desired. When close to room temperature, brush over the tops of the cool cupcakes until a thin layer of syrup is visible on each cake (don’t overdo; too much will make soggy cakes). Set them aside until the syrup sets up and is barely sticky. 05 Make the glaze: Place the lemon juice in a mixing bowl and gradually stir in the confectioners’ sugar (you may not use the full amount) until the mixture is opaque, creamy, smooth and a thick-but-fluid consistency. Spoon about half a teaspoon in the center of the smaller cupcakes (a teaspoon for standard cakes) and spread to the edges. Add more if necessary. 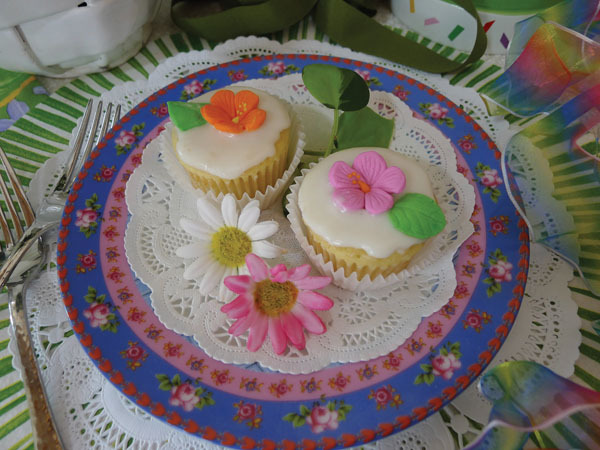 Place a Wilton flower and leaf in the center of each cake and set them aside for the glaze to set. Once it’s set, store the cupcakes in an airtight container in the refrigerator for a day. Serve at room temperature.